The Profit Contribution % or COPE % tracks the proportion of room revenue after commissions, transaction and channel costs are removed. The lower the COPE percentage, the costlier the business is for the hotel and the less room revenue remains, after costs are factored out. To move the needle back to a healthier balance, following Loyalty Contribution % is a key component to fulfilling the hotel’s optimal business mix. 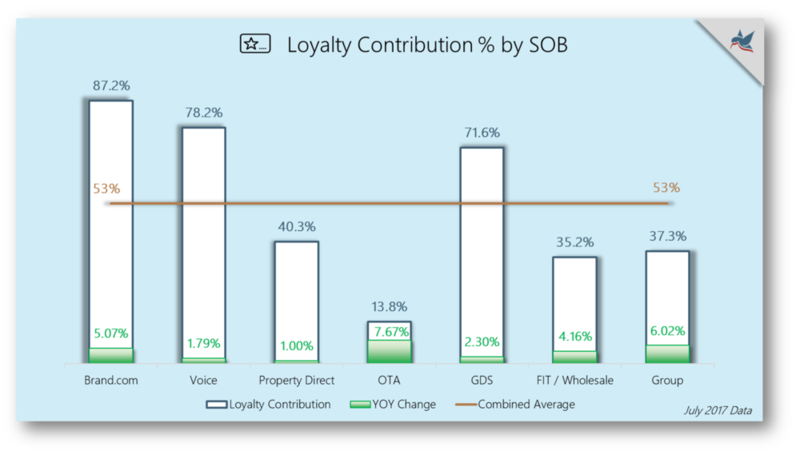 Loyalty Contribution % is the proportion of room night demand associated with a loyalty membership, and vital to continually filling the hotel through direct channels and with repeat business. When reported by Kalibri Labs, this Loyalty Contribution % only includes the brands that have a formal loyalty program. Over the past 18 months the Book Direct campaigns from the major hotel brands have made growing loyalty programs and brand.com bookings a top priority. Within the HIPO report you can track the growth in Loyalty Contribution across the U.S. as well as in top markets, by property size, weekday vs weekend and by rate bands that are important to you. This emphasis on loyalty program growth is only going to intensify, as Loyalty Contribution is becoming the new system contribution across the industry. Ranged from 30.2% for properties in the $0-$60 Guest Paid ADR price point to 60.5% Loyalty Contribution for those properties in the $130-$150 Guest Paid ADR rate band. The lower rated properties Loyalty Contribution grew by the largest amount 14.4% for properties at the $60-$70 Guest Paid ADR price point. The 'smaller' 'lower rated' properties that have seen the largest percentage growth, albeit lowest overall Loyalty Contribution. In our next segment we will review Booking Lead Time, its trends and importance in tracking across the industry.